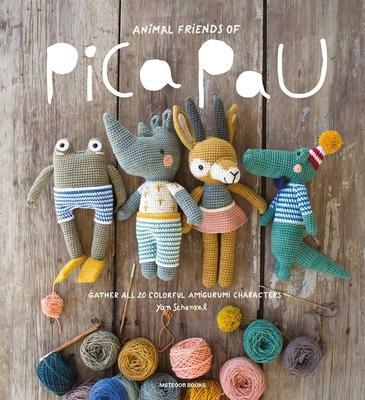 Meet Pica Pau and her amigurumi friends! They're charming, cheerful and cute, and once you get to know them, they'll never leave your heart. The gentle rhino, the energetic otter, the chatty crocodile, the dreamy donkey and many more: each and every one is a happy member of the Pica Pau band. Toy maker, character designer and crochet knitter Yan Schenkel has gathered many colorful amigurumi around her. In this book, she shares her love and knowledge of amigurumi crochet in 20 new designs, and she also gives away the secret ingredients that go into every single project. All patterns contain detailed instructions and are accompanied by step-by-step pictures and explanations of all techniques used, so both beginners and advanced crocheters can easily get acquainted with her amigurumi companions. Immerse yourself in the wonderful world and marvelous magic of Pica Pau and friends. Yan Schenkel is a professional crochet toy designer and the founder of Pica Pau. Besides working on her toys and designs, she has collaborated with several illustrators, authors, and brands. She has worked on a broad range of projects, from illustrating children's books over producing and designing children events at MALBA to designing for a crochet stop motion ad. She is a regular contributor to several crochet and craft publications such as Mollie Makes, The Sewing Box, Simply Crochet, and the Zoomigurumi series. She lives in Argentina.